Our infants attended a variety show and enjoyed a great afternoon of entertainment in the Mattie McDonagh Centre on Wednesday 9th December. First of all they participated in a sing-a-long and they all got into the spirit and showed off their dance moves. This was followed by a magic show. 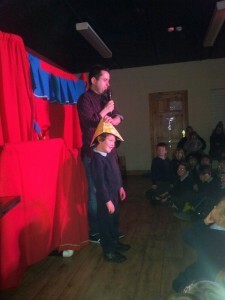 Niall Dowd was chosen as the magicians assisant and helped the magican perform a number of tricks. 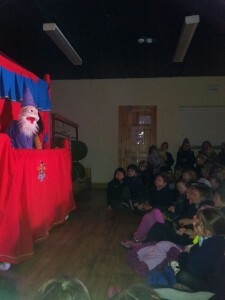 Finally the children were entertained by characters Granny Annie, Boris and the Wizard in a puppet show. Thank you to the Parents and Toddlers group who organised the show for the children.